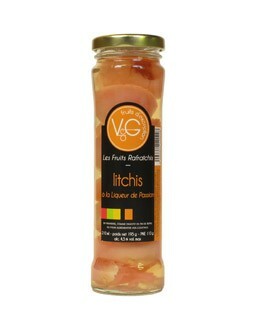 Lychees slightly acid and perfumed with notes of rose candy in a light passion fruit syrup. An Asian mixture which will surprise you. lychees, water, sugar, passion fruit liquor (4,6% at 40°), lychee spirit. Vergers de Gascogne is specialized in the preparation of fruit since 1946. The fruits are sorted manually one by one to ensure maturity and to detect flaws in order to select only the best. Finally, each jar is controlled at least three times before shipping which guarantees optimum quality. The products are 100% natural and are used by many chefs. Serve cool, alone or in a fruit salad.